Inside Plimmerton’s library in the 1950s. 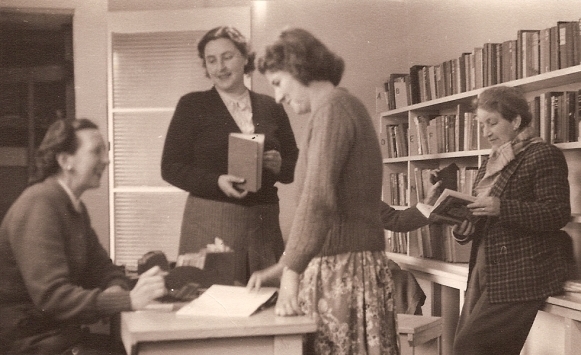 The seated woman on the left is Bev Claridge, next to her with the book is the author Heather Tovey, the standing woman is Jean Mulhern and the other is Mrs Treadwell the infant teacher at Plimmerton School. In the early 1980s Heather Tovey, long time resident of Plimmerton, wrote an account of the beginnings of Plimmerton’s Public Library. Her daughter Carol Henderson has compiled Heather’s memories……. In the late 1940s Mr Priestly started the Plimmerton Public library. It had very humble beginnings as part of the St Andrew’s Plimmerton Hall on Steyne Avenue. The space was shared by many other local groups such as Guides, Cubs, and on some evenings, folk of all ages gathered to participate in the current craze of Square Dancing. Mr P Brayshay made large wooden boxes to hold the books, each box had to be padlocked to put away after library hours. This putting away was a fairly tedious addition for the volunteer librarians, but enabled us to start. Initially the first librarian Mrs V McCallister bought about 50 books at 3 pence each from a library. As a labour of love she took them home and bound them with grey book- binding. They lasted well with several remaining in our collection years later. The volunteer librarians soon started to raise funds to get our own little building. Mr Brayshay negotiated for us to obtain a permit to build on Council land on the corner of School Road and junction of Steyne Avenue and Motuhara Road. Shop days and raffles were organised and soon we had enough money to start building. There were willing helpers who gave their time and materials. Mr Bolland donated much of the timber, Mr and Mrs Newcombe, Betty Bilton (later Betty Kensington), Mrs Treadwell and I took on librarian duties when Mrs McCallister returned to teaching. We proudly moved into our own building in November 1951. When the Country Library Service started to come regularly, visiting around four times a year, our capacity increased to hold an exciting and changing range of reading material. The day the Country Library van rolled into the village was a red letter day for all volunteer librarians. We could hardly wait to jump aboard and begin choosing the next quota of new books. Later when the Porirua Library opened we still continued with our old system with all voluntary helpers. Although we had Porirua’s extensive library at our disposal, our little local library with its small and friendly atmosphere still supplemented the bigger library, and for many Plimmerton Library continued to fill a definite need.